Deep joy of the leaping fire to you. Deep peace of the Prince of Peace to you. 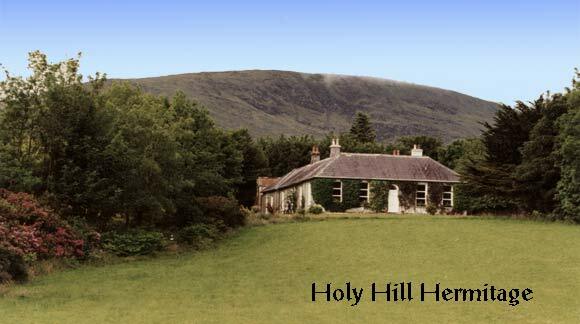 Nesteled beneath the Ox Mountains in Co. Sligo, Ireland, Holy Hill Hermitage offers a quiet and beautiful place where people of any faith or walk of life can come to "Be still and know that I am God" (Psalm 46:10), and to experience the deep peace of the ancient Celtic saints. What is Holy Hill Hermitage? Holy Hill Hermitage is home to a small community of men and women who live as apostolic hermits according to the Carmelite tradition. Together with Nada Hermitage in Crestone, Colorado, we form the Spiritual Life Institute, a community dedicated to simplicity of life, contemplative prayer, and, when appropriate, apostolic outreach in the Church and society. (For more information on the Spiritual Life Institute visit the "about us" page.) Founded in 1995 on the site of what had been a 19th-century landlord's estate, and more recently a Convent of Mercy, Holy Hill has slowly grown into a center of prayer and retreat in the beautuful northwest of Ireland. We welcome anyone who wants to make a private retreat for a day, a week, or longer, or to come for extended sabbatical time. Regular Retreats: People making a longer retreat stay in a beautiful, private hermitage with bed and bath facilities, a comfortable chair, writing space and cooking facilities. Basic foods are provided: fresh fruit and vegetables, bread, eggs, milk, cheese, porridge, grains and canned goods. Spiritual direction is available. We also have one hermitage (a small cottage) available for couples who want to come on retreat. Retreatants may join the community for a few hours of manual work, such as gardening, if they wish. Anyone who is not able to afford the full fee may come as a work-retreatant. All retreatants are welcome to join the community for communal prayer and liturgies, and for our Sunday communal lunch after Mass, but everything is optional. Our chapel is always open for your use. Our library of over 6,000 books includes spiritual classics and the best contemporary literature. Set in the beautiful stone19th-century outbuildings, it is a favorite place for monks and retreatants alike. Our community building, Carrowcullen ("place of the holly"), has sitting rooms for your use.You will also have access to our gardens, courtyards, and grounds. There are lovely walks along the Ardnaglas river which forms the eastern border of Holy Hill. A 5000-year old megalithic tomb on our property is also well worth a visit. Bring warm, comfortable clothes, and good walking shoes. It can rain at any time, and often does, so bring rain gear. Dunmoran strand, a beautiful beach on the north Atlantic is just three miles away, and the Ox mountains, offering breathtaking vistas of Sligo Bay, Benbulben, and Knocknarea, are just a mile to our south. Sligo, a lively and lovely town, is fifteen miles away and at the heart of "Yeats country." If you are new to the area may want to plan some time before or after your retreat to visit the many scenic and historic sites in the area. A Day Away: Our "Day Away" offering is a mini-retreat for anyone who would like to make a quick get-away. The day is spent in a hermitage with cooking facilities (food is provided) and you would have access to the chapel, library, and our spacious grounds. Spiritual direction is available on request. Making a reservation: To schedule a hermitage for a Day Away or a longer retreat or sabbatical, please contact us as far in advance as possible using the contact information below. If you write or e-mail, give the dates you would like to arrive and depart, and if possible give an alternate choice. Travel: There are numerous public transportation options for those coming to Holy Hill. From the Dublin airport take the Airlink bus to the central bus station. From there you can get a bus to Sligo (Note: there is a travel information booth on the lower level of the Dublin airport that can give you excellent information on travel in Ireland.) Connolly train station is one block north-east of the bus station in Dublin and trains depart from there regularly to Sligo. The train and bus stations are adjacent in Sligo. There are regular buses from Sligo that go through Skreen. Ask the bus driver to let you off at the cemetary by the Catholic church in Skreen. If you arrange ahead, we can meet you there and bring you to Holy Hill. Sometimes these connections are not possible for travelers. Please keep in touch with us about your travel plans in case we need to make alternative arrangements to pick you up. Directions for those driving: Holy Hill is on the Ladies Brae Road 2km south of the N59 (the Sligo-Ballina road). The turn off for the Ladies Brae road on the N59 is just east of the Catholic Church and cemetery in Skreen. Watch for the brown sign for Holy Hill Hermitage. Cost of Retreat: We suggest a donation of 65 euros for the first night and 60 euros for each additional night. A full week retreat is 375 euros. Sabbaticals are 1200 euros per month. Special arrangements can be made for longer retreats. Please check our SLI Retreats Page for further information and frequently asked questions. Holy Hill is an ideal place for an unstructured sabbatical. If you are retiring, changing ministry or transitioning in life in some way, take the opportunity to discover more about Christ and your deepest self. Three people who came in 2006 wrote reflections on their time here. Click here to read their reflections. If you are interested in a sabbatical at Holy Hill, please contact us using the contact information below. The first Sunday of every month, except January, is a "Visiting Sunday." We have mass at 12 noon followed by a time for a visit and a cup of tea. (You are welcome to bring a lunch with you.) After Mass, we give a tour of Holy Hill for anyone interested. The afternoon ends with a short meditation in the chapel at 2 p.m. Everyone is welcome for any part or all of the afternoon. We hope to see you then! In addition to our retreats and Visiting Sundays we also on occasion offer Days of Recollection and special guided retreats. We are sometimes available to give retreats and conferences outside of Holy Hill. Use the contact information below to make inquiries. We welcome visitors to Holy Hill. But to preserve the silence as much as possible for the sake of those who come on retreat, we ask that if possible you notify us of your visit ahead of time so that we can suggest a mutually agreeable time for your visit. If you are coming with a group and would like a personalized tour, please call several weeks prior to your arrival. As you may have read on our general information page, our primary mission is to pray. If you have a concern you would like us to bring to our prayer, please do not hesitate to let us know.